There are reasons why Tchaikovsky’s Piano Concerto No. 2 is rarely performed, starting off with the mach-speed hand dexterity required in the solo passages, not to mention the uniqueness of its orchestral structure. The musical implications in this concerto seem to foreshadow a new classical era and even concepts in jazz. Russian conductor Vasily Petrenko, in his first guest spot with the Fab Phils, kept to a straightforward, unfussy approach in essaying the tight dynamics between soloist and orchestra. 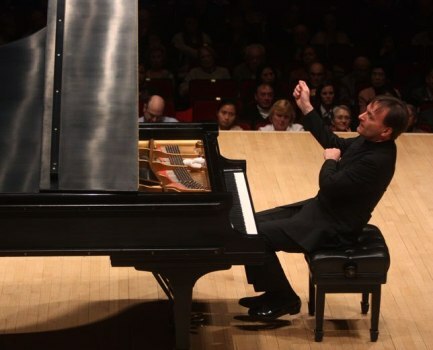 And who cares about the history when you are spellbound watching Stephen Hough play mach-speed passages from memory? Hough gets inside Tchaikovsky’s fevered-note density so completely, you catch on that this is inexplicable alchemy on top of virtuosic skill. It would be easy to get lost in the solos, but Petrenko’s ability ignites the full scope of the work. A bit tamped down was the second movement string dialogue between violinist Juliette Kang and cellist Efe Baltacigil. Both are exquisite players, with sinewy expressiveness, but not quite matching Hough’s sheer power, which surged majestically during the full orchestral sections. Hough left you exhausted, but Prokofiev’s Symphony No. 5 more than snapped you back to attention in the second half. Actually, the dissonant waves in first movement just enveloped the hall. Petrenko got to all of the composer’s “freedom of man” subtext instantly—a Prokofiev signature that reached concussive proportions, the encroaching symphonic beats like a diabolical metronome. (Is it nationalism or veiled political protest in Stalinist Russia?) But this symphony is equally lustrous in the quieter interludes, in which the orchestra floats with equal vibrancy. Petrenko was physically expressive while conducting the subtler phrases, showing complete involvement with the musicians.